We present the DARTH FADER algorithm, a new wavelet-based method for estimating redshifts of galaxy spectra in spectral surveys that is particularly adept in the very low SNR regime. We use a standard cross-correlation method to estimate the redshifts of galaxies, using a template set built using a PCA analysis on a set of simulated, noise-free spectra. Darth Fader employs wavelet filtering to both estimate the continuum & to extract prominent line features in each galaxy spectrum. 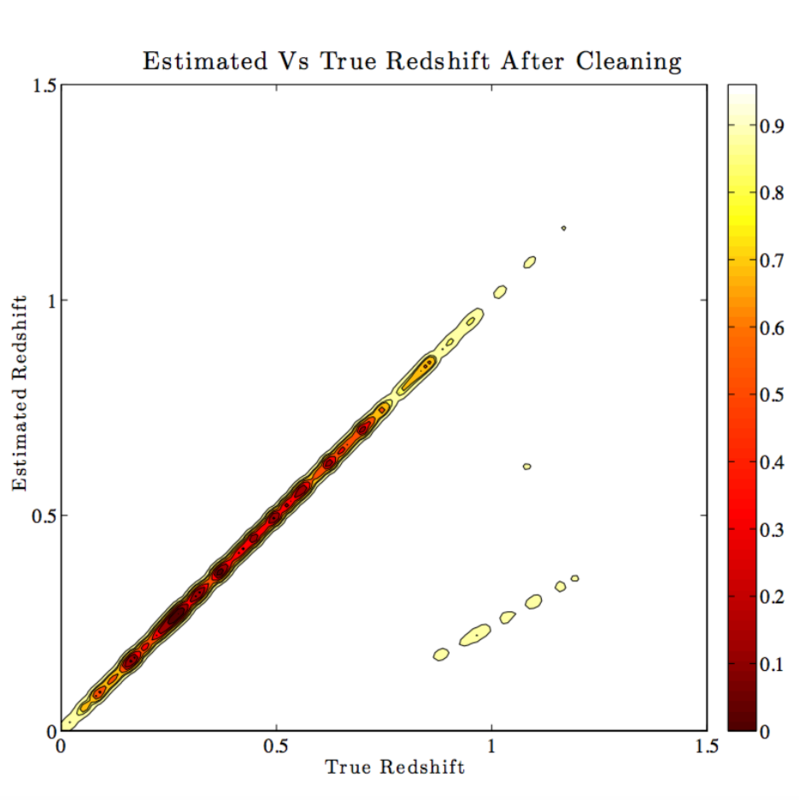 A simple selection criterion based on the number of features present in the spectrum is then used to clean the catalogue: galaxies with fewer than six total features are removed as we are unlikely to obtain a reliable redshift estimate. Applying our wavelet-based cleaning algorithm to a simulated testing set, we successfully build a clean catalogue including extremely low signal-to-noise data (SNR=2.0), for which we are able to obtain a 5.1% catastrophic failure rate in the redshift estimates (compared with 34.5% prior to cleaning). We also show that for a catalogue with uniformly mixed SNRs between 1.0 & 20.0, with realistic pixel-dependent noise, it is possible to obtain redshifts with a catastrophic failure rate of 3.3% after cleaning (as compared to 22.7% before cleaning). Whilst we do not test this algorithm exhaustively on real data, we present a proof of concept of the applicability of this method to real data, showing that the wavelet filtering techniques perform well when applied to some typical spectra from the SDSS archive. The Darth Fader algorithm provides a robust method for extracting spectral features from very noisy spectra. The resulting clean catalogue gives an extremely low rate of catastrophic failures, even when the spectra have a very low SNR. For very large sky surveys, this technique may offer a significant boost in the number of faint galaxies with accurately determined redshifts.